Samskriti Business Solutions is listed as one of the “The 10 Best Google Partners to Watch in 2017” in Insights Success Magazine. Insights Success is an arch that is sustaining Entrepreneurs quench regarding technology and business update that is currently ruling the business world. Insights Success Magazine aims to be a thorough guide to all the diverse challenges of businesses. 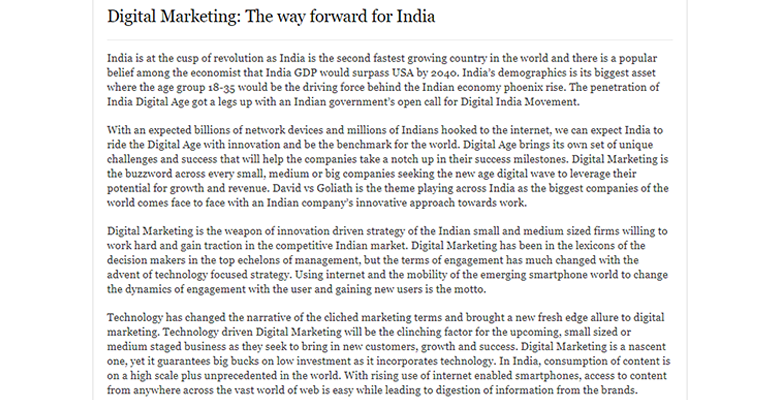 The interesting article titled "Digital Marketing: The way forward for India" published in Insights Success Magazine. Digital Marketing is the weapon of innovation driven strategy of the Indian small and medium sized firms willing to work hard and gain traction in the competitive Indian market. Digital Marketing has been in the lexicons of the decision makers in the top echelons of management, but the terms of engagement has much changed with the advent of technology focused strategy.